On Thursday 13th February YMCA St Paul’s Group unveiled our plans for a new housing solution called Y:Cube that provides self-contained and affordable starter accommodation for young people unable to either gain a first step on the housing ladder or pay the high costs of private rent. The unique off-site construction and system made by world-renowned architects Rogers Stirk Harbour + Partners provides high quality accommodation which can be built faster, and crucially cheaper, than using traditional methods of construction. “As the largest provider of supported accommodation for young people in the country, YMCA is increasingly seeing young people struggling to afford the costs of private rent. Even for a young person in employment, a combination of low wages and high rents can quickly see them priced out of the market. We constantly see young people thrive and gain independence within our hostel accommodation, only to be left with no options when it comes to the time for them to move on. We believe Y:Cube presents a significant opportunity to deliver genuinely affordable housing to meet the increasing housing demand in London that is not only affordable to rent but with the added effect of low utility bills. The demand for affordable housing is significantly outstripping supply and the city desperately needs to dins a solution which can enable young people to secure a place to call their own, while working and saving for a deposit and their next step towards independent living”. Y:Cube uses a pre-constructed ‘plug and play’ modular system which enables the streamlined units to stack easily on top or alongside each other, making it completely adaptable to the size and space available and therefore perfect for tight urban sites. 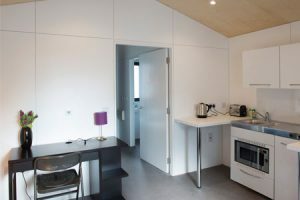 Each unit is constructed from high quality, eco efficient materials (primarily renewable timber), creating accommodation that is so well insulated that they require little or no heating, even in winter months. This presents further valuable savings as the cost of energy rises. The Y:Cube units are 26m2 studio-like apartments made for single occupancy. They arrive on site as self-contained units and each unit is constructed in the factory with all the services already incorporated, meaning that water, heating and electricity can be easily connected to existing facilities or to other Y:Cubes already on site. 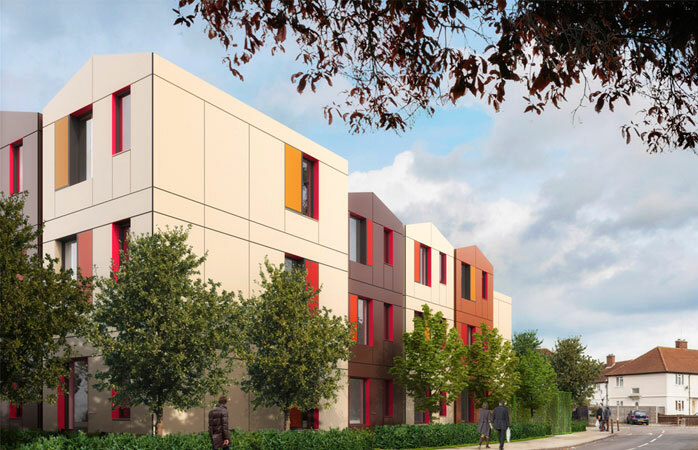 It is hoped that the first Y:Cube Housing scheme could open in Merton by the end of 2014, providing 36 homes for local people in housing need. This will be a much sought after scheme in London, where housing prices are booming. The Y:Cube is designed by Rogers Stirk Harbour + Partners, an award-winning, international architecture practice based in London. The quality of its designs has been recognized with some of architecture’s highest awards, including two RIBA Stirling Prizes. “The Y:Cube delivers generous space, exceptional insulation, daylight and acoustics. We believe it holds many answers for well-designed and sustainable urban living and this approach of delivering fully kitted out units could change the way we think about our housing into the future. We look forward to working with the YMCA to help create homes for those most in need”. For further inquiries about Y:Cube, please contact us on 020 8339 7308.